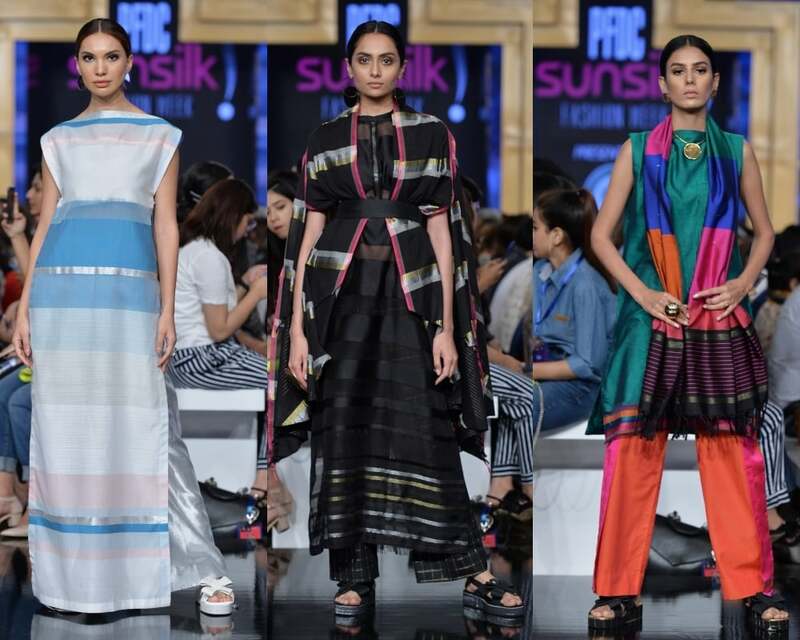 Horizontal stripes, hand-woven colour blocks and the prettiest folk embroideries on spunky, modern silhouettes – this is what I will always remember about the second day of the PFDC Sunsilk Fashion Week (PSFW). At the risk of sounding clichéd, may I say that it was a day that started strong and ended strong? Chapter 2, that miraculous little fledgling brand created by high-street giant Khaadi, started things off with a technicolor splash and it could have easily been declared that the show was the day’s crowning moment … except that Kamiar Rokni, fashion’s favourite blue-eyed boy, swooped in right at the very end with a finale that sang folk tunes, remixing them to modern-day techno-beats, creating catwalk magic. Clichés, after all, become clichés because they make sense. Also, interspersed between the grand opening and finale were some other very good fashion shows: one veteran brand, another that is rapidly coming into its own and a trio of fashion’s ‘rising talents’. Chapter 2 by Khaadi played up to its strength of hand-woven fabric, moulding it into fluid silhouettes, adding bright dashes of colour and expertly mixing textures. It was modern but simple, effortless but styled with great detail, ideal day-wear but then again, why not accessorise it for the red carpet? For a brand that is yet to turn two, Chapter 2 has matured so very quickly, aided of course by the design experience and expertise of its mothership Khaadi. I wouldn’t say that the collection was unpredictable but Chapter 2 doesn’t need to be. It's worth noting that the brand innovated without wavering from its signature ethos. There were horizontal stripes worked onto minimal, androgynous silhouettes, whites flecked with light blue, classic black and golds and stoles that were statements all on their own. Quite fabulous. Bring it to retail racks, Chapter 2! 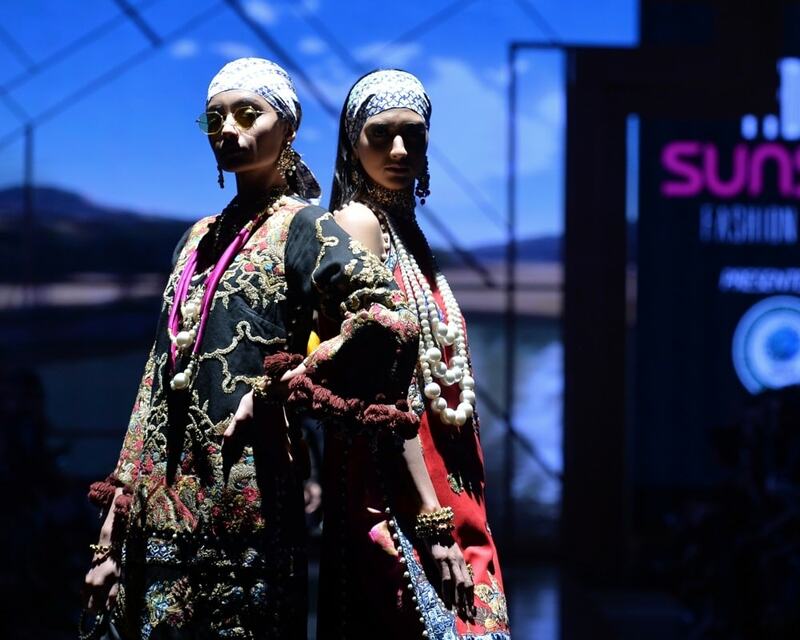 A sense of deja vu prevailed throughout Sana Safinaz’s ‘Boheme Luxe’ showcase. 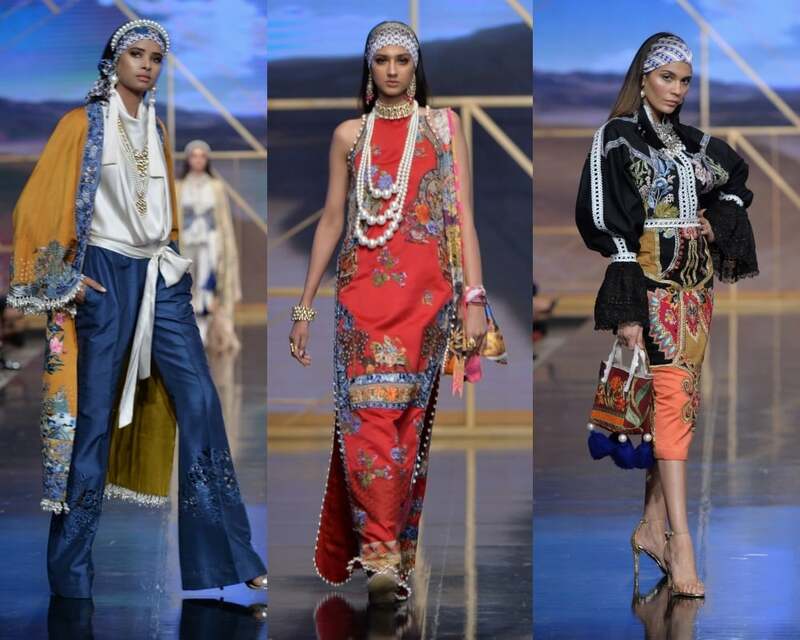 Wasn’t a semblance of the same collection called ‘A Message from the East’ seen at Karachi’s Fashion Pakistan Week? The first quarter of that earlier collection from a few weeks ago had featured the brand’s new take on affordable wedding-wear that can be ordered bespoke from their studio. It had had a bohemian tribal vibe, a laidback glamour that had screamed ‘destination wedding’, clothes for the modern girl who loves fast fashion even in her formal evening wear and wedding wardrobe. There was more of the same in the collection showcased now at PSFW. To be fair, the designers had mixed in newer pieces amidst the older ones and adeptly mixed and matched in order to spruce things about. Lowers were switched about, a ribbon sash was replaced by a tribal belt, sleeves were added to a sleeveless. 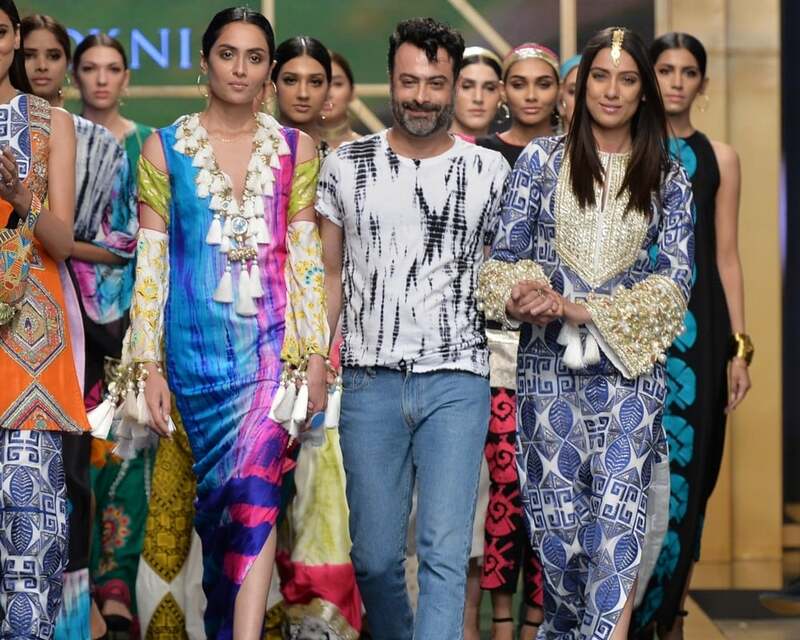 Nevertheless, the collection’s essence remained the same and even the styling, so very noticeable at FPW, followed the same guidelines: long straight hair, bandannas, a cool pair of shades. If Sana Safinaz’s aim was to place emphasis on their all-new affordable lineup of formals then they succeeded in doing so. But the earlier collection had gone viral on social media, declared a ‘hit’ and scrutinised upclose by fashion aficionados. I feel that there was no need to show a version of it all over again. Kudos to the Pakistan Fashion Design Council (PFDC) for persisting on with their support of promising up and coming designers. I remember the Rising Talent showcases from long ago that were predominantly cringeworthy student displays of unwearable, unfathomable design. 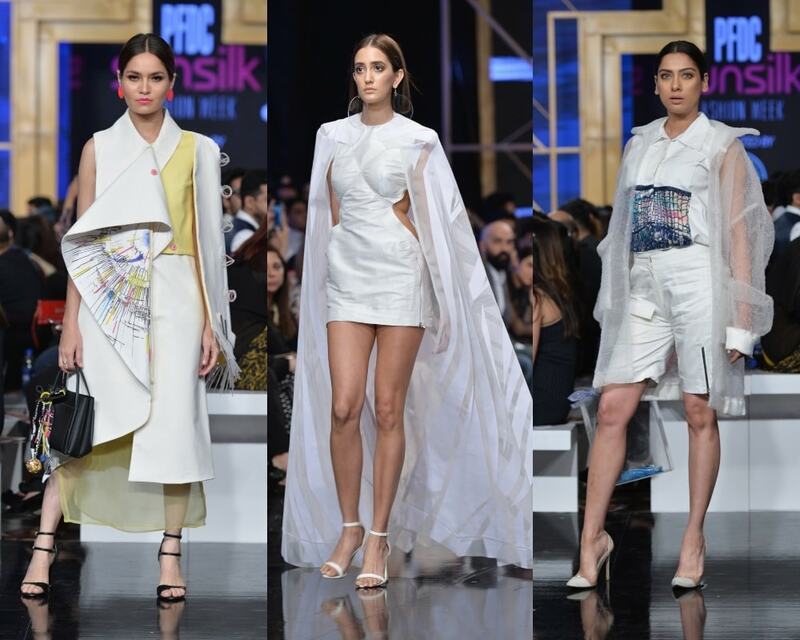 Then, the PFDC had stepped up the game by choosing veteran designers as mentors for the ‘rising’ lot, guiding them into creating more streamlined collections. But just as things were picking up, the main sponsor had backed out and the platform had kaput. Nevertheless, after a two year gap, the PFDC has now decided to continue on with the platform and, just as importantly, is continuing to mentor the selected collections. 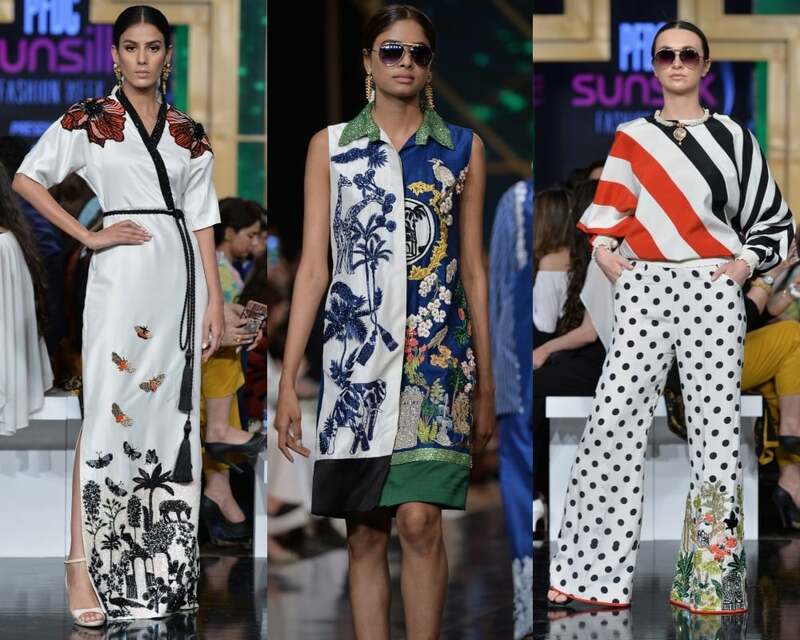 This time’s ‘Rising Talent’ triad: Hafsa Mahmood, Mahnoor Azam and Zeeshan Mohyuddin – showcased designs that had plenty of potential. A year more in the business and these young ‘uns could be allotted solo slots of their own at fashion week. Hafsa Mahmood implemented geometric prints and drapes onto contemporary silhouettes. The single sleeved cape worn by model Fahmeen Ansari was a winner. Mahnur Azam interestingly mixed transparent plastic with fabric, working with a palette of white and blue. Zeeshan Mohyuddin, also, took inspiration from geometry, working with black and white monochrome. There was a lot that caught the eye in his capsule show: the structured white dress with a cape, right out of a Marvel movie, the shirt with the exaggerated black shoulder pads and striped sleeves and the dress with the black and white pixelated neckline. Experimental but not outlandish, with plenty of intriguing details – I am hoping to see these designers pave the future of fashion in coming fashion weeks! 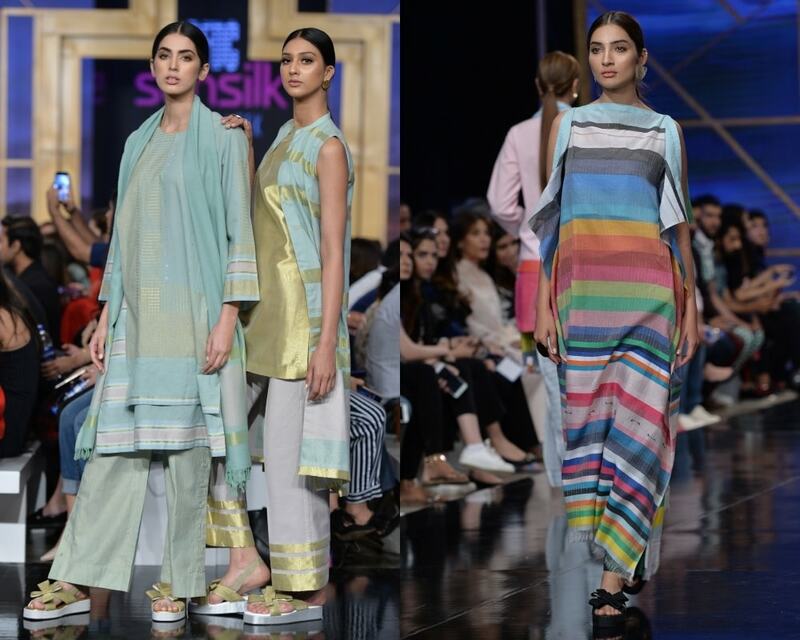 Saira Shakira’s colour wheel rolled out some very pretty combinations: whites worked with deep reds, royal blues and spurts of green. Scampering about this canvas were a zany jungle of flora and fauna: zebras, giraffes, butterflies, palm trees! There were also polka dots, stripes and chequered prints mixed in with the embroideries. 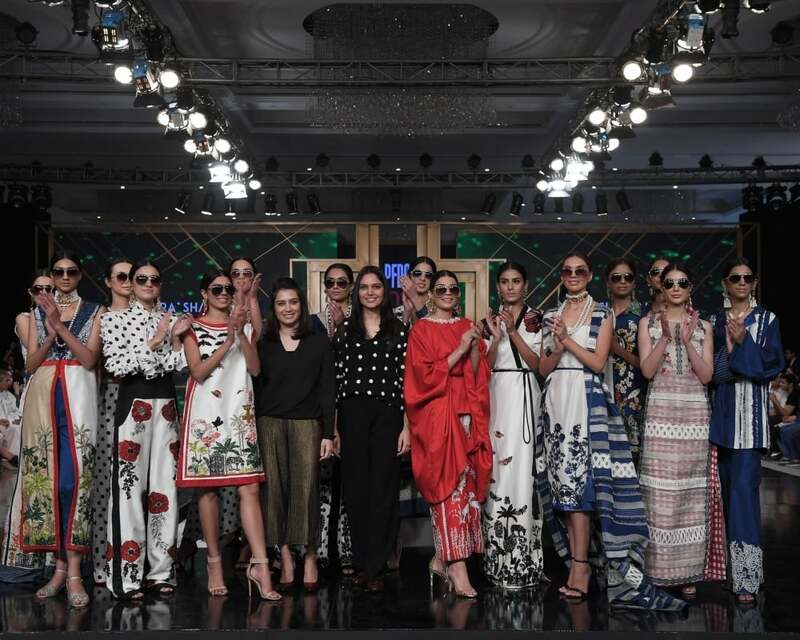 It was an upbeat, fun spin to embroidered formals and Saira Shakira also tweaked silhouettes here and there: a polka dotted shirt with ruffled sleeves, criss-crossing swathes worked into a shirt and a long white dress belted casually at the waist, amidst the usual pant and tunic combinations. Sharper tailoring would have certainly helped things but this designer brand really is coming along well. Then came the House of Kamiar Rokni with their Neo-Folk. There was a time when I had critiqued that while this brand is in a league of its own, it needs to be more prevalent on the catwalk in order to make impact. 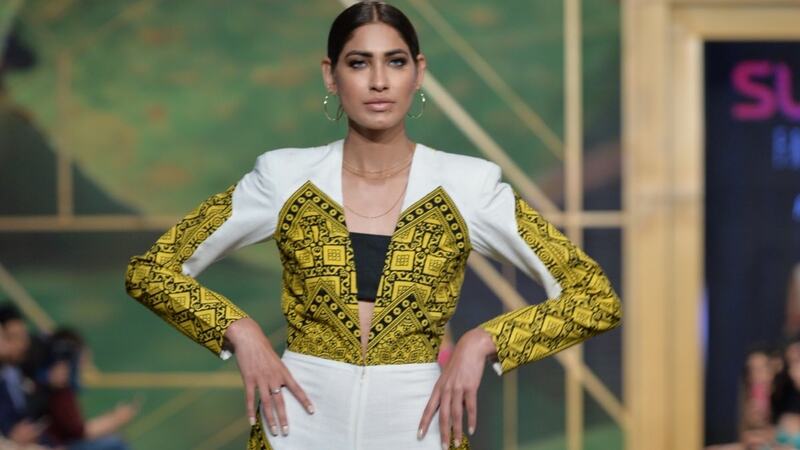 Apparently, designer Kamiar Rokni really read the review and a mere seven months since his last bridal show, he’s back with ‘Neo-Folk’, veering away from his love for couture and creating pret for the fashion forward. Apparently, the collection is also going to be more affordable than his couture. 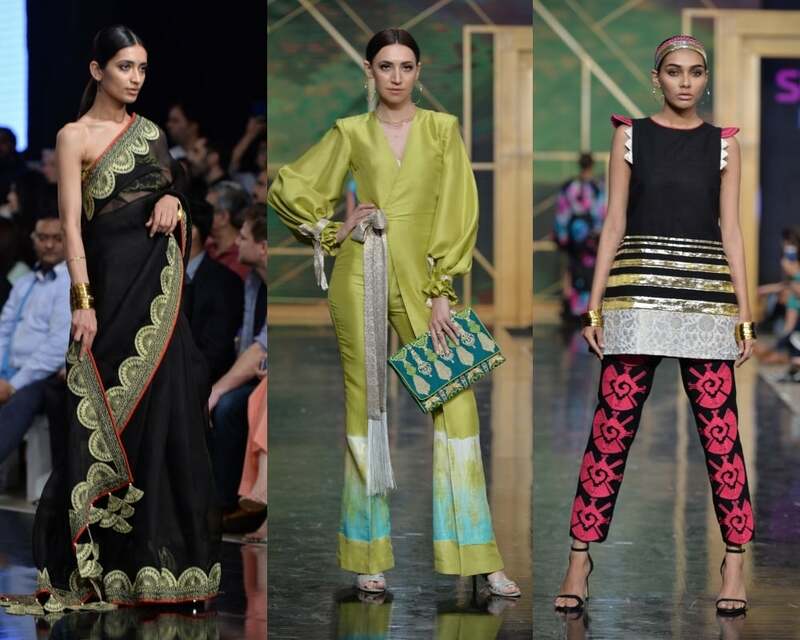 When most designers decide to delve towards ethnic inspirations, they simply churn out indigenous handicraft onto a handful of gharara pants, dupattas and necklines. Not Kamiar Rokni, thankfully. Traditional embroideries were placed in unconventional ways around necklines, pockets and pants. There were vivid tie-n-dyes, block prints, gota, pearls, and dashes of brocade and while one is familiar with all these design elements, Kamiar Rokni’s prowess lies in breathing new life into them. The colour play, the geometric patchwork, the mix of gota-pearl-print-embroidery and the cutting-edge, neat silhouettes all worked out into a line that proves that the designer is still at the top of its game. Within this pret line, however, there were also some embroidered wedding outfits. The kurtas with tukri, gota and mirror-work, the ghararas and the shirts and pants glistening with heavy duty embroideries were beautiful and thematically, continued to follow the ‘folk’ theme. They could not, however, qualify as pret. Then again, this is a dilemma that is fast becoming prevalent at all fashion weeks. Designers showcasing their collections on a catwalk need to balance out the creative, statement pieces with what actually sells from their studios. This is what the House of Kamiar Rokni did, balancing out clothes that followed the PSFW’s mandate for pret with dashes of wedding-wear. It was still so lovely. I hope that Kamiar Rokni continues to show consistently at fashion weeks. 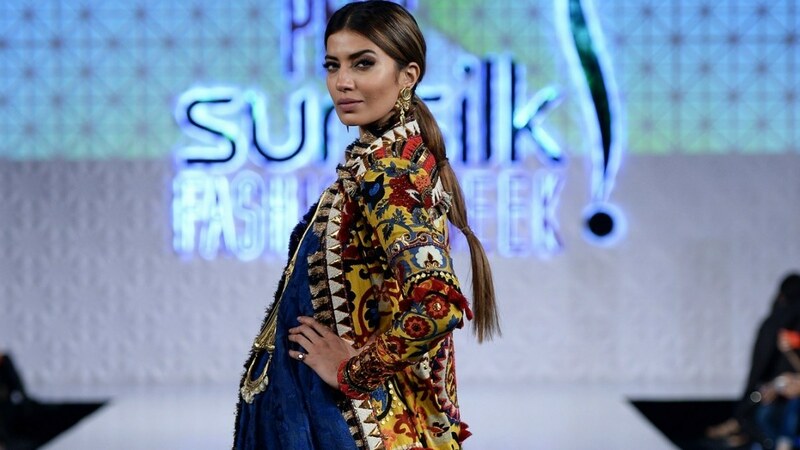 The finale wrapped up the second day of PSFW on a high. What a strong day for fashion. May we have many more. Keep or toss: Would these 9 looks from PSFW find way into our wardrobes? While some of them are attractive, these clothes are anything but Pakistani.